Here’s a keyboard that not only respects the alphabet, it respects our need to implement abbreviations into out messages and IM’s. For the beginners (or the one finger at a time typists) the keyboard is laid out alphabetically and is activated with a press of the ‘ABC’ button. Those who posses more adroit typing abilities than a typical beginner, can switch the ‘ABC’ button off for the standard QWERTY keyboard experience. These letters are laid out underneath the keys in alphabetical order, in red. For its last trick, the Fast Finger Keyboard does typical IM abbreviations (‘LOL, ‘CYA’ ‘BTW’) with the push of the ‘F’ key to make your abridged conversation reach your IM buddy in a nice and speedy fashion. 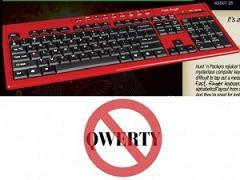 Get the three-way keyboard here for $27.95 USD.